Cloud9 and TSM has never been a rivalry to disappoint over the years, and this semifinal was no different. Cloud9 continued with its knack for innovation right out of the gate, drafting a Sona/Taric Bot Lane for Zachary "Sneaky" Scuderi and Tristan "Zeyzal" Stidham. The duo was able to hold their own and transition into a full double supportive role for the team, giving over farm to Dennis "Svenskeren" Johnsen's Hecarim near the end of the laning phase to extend his carry potential. Cloud9 followed up a 25 minute victory in game 1 with a stellar performance in game 2 from Svenskeren's Rek'Sai. With TSM Jungler Matthew "Akaadian" Higginbotham missing smites and looking utterly outclassed on Jarvan IV, Cloud9 quickly went up 2-0 and took the series to match point. After receiving his Coach of the Split Award, Cloud9 Head Coach Bok "Reapered" Han-gyu predicted a flat 3-0 in an interview with Ovilee May. However, TSM refused to go quietly into the night. Game 3 was a back and forth affair, but TSM Mid Laner Soren "Bjergsen" Bjerg was enough to make the difference for TSM. When the dust settled after 45 minutes, Bjergsen stood tall on a 9/0/6 Akali, leading TSM to victory and back into the series. Cloud9, seemingly uninterested in letting TSM go to another late game, drafted extremely aggressively in game 4. Top Laner Eric "Licorice" Ritchie took Ryze into the Top Lane, while Mid Laner Yasin "Nisqy" Dincer tested his mettle against Bjergsen's Zoe with a pick that shocked the onlooking crowd — Zed. Unfortunately, any spice Cloud9 could throw into the pot was outweighed by the flavor of the series in Rek'Sai. Rek'Sai had already netted Cloud9 2 wins in the series, and in the hands of Akaadian it made all the difference. A complete reversal of momentum in the jungle, highlighted by a series of C9 misplays after a game pause, brought the series to Game 5. Cloud9 edged out an early lead and stayed a step ahead of TSM, but a late game team fight led to a Baron fight that turned the tides in TSM's favor. 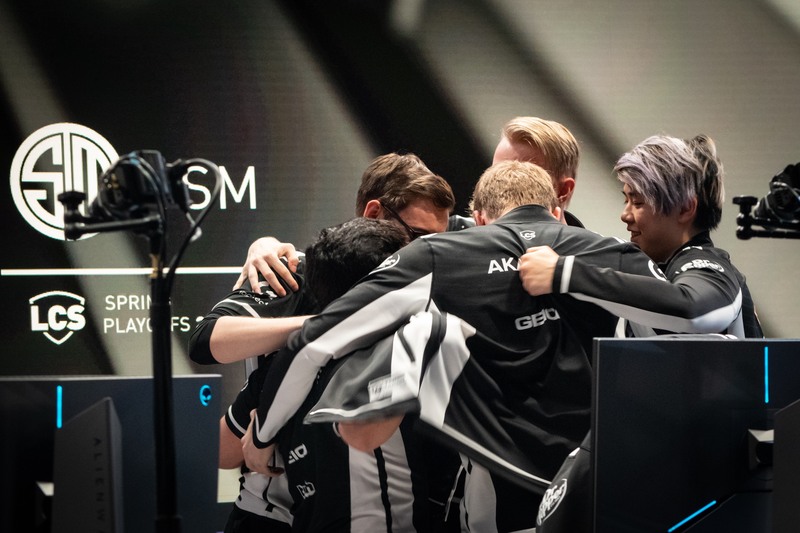 After nearly twenty more minutes of excruciating back and forth play, TSM was able to secure a second Baron and crack Cloud9's final nexus and complete the reverse sweep. Bjergsen was awarded player of the series. Analyst Mark Zimmerman called his Akali performance 'the stuff of legend', but Bjergsen was able to bring his team back into the series in multiple ways. The Akali performance was the highlight, but the Zoe and Zilean games were equally impressive for different reasons. TSM missed its very first LCS final last summer, and now finds itself right back in one. TSM will travel to St. Louis next week to face the winner of Team Liquid and FlyQuest in the second LCS semifinals match. In a post-match interview with Ovilee May, Bjergsen shared his thoughts on who he expected to face in STL. "Obviously Team Liquid has looked really strong all split, but a best of five can go either way," said Bjergsen. "Both teams have specific styles and champions they like to play, but due to the amount of experience and talent on Team Liquid, I think they are likely to win the series." FlyQuest plays Team Liquid Sunday, April 7 at 11:30am PST to see who will face TSM in the LCS finals on twitch.tv/riotgames.